Ancient Stones - Lothian - 041 Standing Stone, Gormyre, Torphichen. This large upright boulder sits on the summit of a low ridge, just north of the road leading to Gormyre Hill, west of Torphichen. 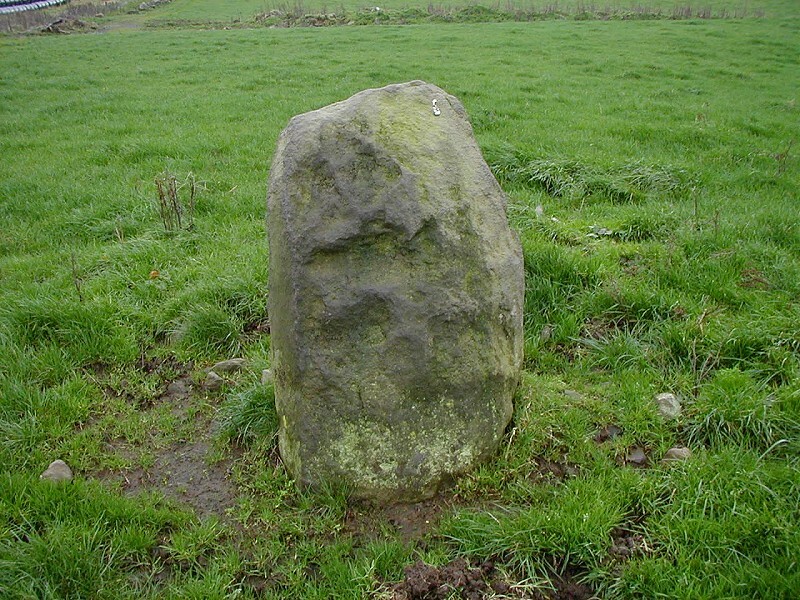 Erroneously marked "Refuge Stone" on O.S. maps. The stone is of a hard red grit and reaches 1.20m high. The outline of a Maltese cross once decorated the north face but is no longer visible. This is one of the stones marking the area of the sanctuary associated with Torphichen Preceptory. Starting at the parking area beside Witch Craig Wood and the Korean War Memorial, follow the road towards Torphichen. 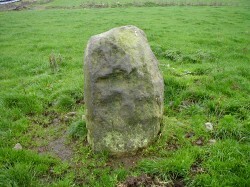 The stone is in the fields to the north. Parking area beside Witch Craig Wood and the Korean War Memorial. This stone was one of the 'refuge stones' that formed a circle at a distance of a mile around Torphichen Preceptory. All of the space within the circle formed by these stones was as much a legal sanctuary as the church itself and offered protection against the law to every criminal or debtor who entered and remained within its precincts. I'm sure on a clear and bright sunny day this tone would be interesting but on the day of my visit it was cold, wet and dull - not the ideal conditions for viewing standing stones. The stone, also noted as a sanctuary marker is claimed to be one of the sanctuary stones for Torphichen Preceptory, however, there is some debate about this fact.